Yisui shengxue granule, 60Co-γ rays-irradiated mice, Granulocyte-macrophage colony stimulating factor (GM-CSF), Granulocyte-macrophage colony stimulating factor receptor (GM-CSFR). Yisui Shengxue Granule (YSSXG) is a traditional Chinese medicine compound preparation, which can be used to treat anemia . Previous studies of this compound have focused on its curative effect on thalassemia and its molecular mechanisms [2-4]. Recent studies have shown that YSSXG and its effective components significantly improve radiation-induced Bone Marrow (BM) injury repair. YSSXG has been reported to increase counts of peripheral red blood cells, white blood cells, and platelets, promote hematopoietic progenitor cell colony forming units and Hematopoietic Stem Cells (HSCs), and control the cell cycle progression of BM [5-8]. These findings indicate that YSSXG may promote the proliferation and differentiation of myeloid hematopoietic cells. Some studies have demonstrated that the interaction of Granulocyte-Macrophage Colony Stimulating Factor (GMCSF) and the GM-CSF receptor (GM-CSFR) is crucial for regulating the proliferation and differentiation of myeloid hematopoietic cells [9,10]. In order to explore the molecular mechanisms associated with YSSXG-induced regulation of myeloid hematopoietic cell proliferation and differentiation, this study examined the effects of YSSXG on the expression of GM-CSF and GMCSFR in BM from irradiated mice. Fifty-two Kun-Ming, clean grade, male mice (weight, 18-22 g) were obtained from Beijing Huafukang Biotechnology Corporation (Certificate of quality No. SCXK (Beijing) 2009-0007). Mice were maintained in conditions of standard temperature, relative humidity, and light/day cycles, with free access to food and water. The experiment began after a 1-week acclimation period. Approval for this experiment was granted by the Experimental Animal Ethics Committee of the Capital Medical University. In total, 52 mice were randomized into four groups (n=13): blank group, model group, positive drug group, YSSXG group. With the exception of mice in blank group, all mice received whole-body irradiation by 60Co-γ rays (60Co Tele-therapeutic Machine, produced by Nuclear Power Institute Equipment Manufactory, China), with an absorbed dose of 3.5 Gy, at an absorbed dose rate of 1.31 Gy/min. Two days prior to modeling, mice in YSSXG group were administered 3 g/kg YSSXG intragastrically [5-6,8]. Mice in groups of blank, model and positive drug were administered with distilled water (0.1 mL/10 g body weight). The next day after modeling, mice in positive drug group were hypodermically injected with 30 μg/kg (injection volume 10 mL/kg) recombinant human Granulocyte Colony-Stimulating Factor (G-CSF), while mice in the other groups received the same treatment as that prior to modeling; these courses continued for 14 consecutive days [5-8]. On 15th d after modeling, the mice were anesthesized with 10% chloral hydrate. When the mice were in the anesthetic stage, volume of 1mL blood was collected from the orbit. After blood collection, mice were sacrificed by pulling the vertebra. YSSXG comprised 11 types of Chinese medicines: Fructus Corni (Cornus officinalis Sieb. et Zucc. ), Radix Rehmanniae Preparata (Rehmannia glutinosa Libosch. ), Radix Polygoni Multiflori (Polygonum multiflorum Thunb. ), Radix Astragali (Astragalus membranaceus (Fisch.) Bge. Var. mongholicus (Bge.) Hsiao. ), Radix Angelicae Sinensis (Angelic sinensis (Oliv.) Diels), Radix Codonopsis (Codonopsis pilosula (Franch.) Nannf. ), Fructus Psoraleae (Psoralea corylifolic L.), Colla Corii Asini (Equus asinus L.), Fructus Amomi (Amomum villosum lour. ), Caulis Spatholobi (Spatholobus suberectus Dunn) and Carapax Trionycis (Trionyx sinensis Wiegmann). It was produced by Guang’anmen Hospital Preparation Factory according to the patent protocol (No. CN1872182, Batch No. 20110506), in 12 g/pack (1 g powder contains 2.368 g of crude drug). The oral dose for 60 kg body weight of adult is 12 g each time, 3 times per d. Fingerprint chromatograms were used to evaluate YSSXG’s quality . Recombinant human G-CSF injecta (Batch No. 201111B45) was produced by Amoytop biotechnology Co. Ltd. (China), in 75 μg/vial. The GM-CSF radioimmunoassay kit (Batch No. 20120905) and trizol reagent (Batch No. 14105) were obtained from Beijing Huaying Biotechnology Institute (China) and Invitrogen Life Technologies (USA), respectively. Fermentas K1622 RT reverse transcription kit (Batch No. 00044977), SYBR-green PCR Master Mix Kit (Batch No. 1201329), and rabbit anti- GM-CSFR beta (bs-3689R) were purchased from MBI (USA), ABI (USA), and Beijing Biosynthesis Biotechnology Co. Ltd. (China), respectively. Biotin labeling goat anti-rabbit IgG (SP-0023), horseradish peroxidase-labeled streptavidin (HRPstreptavidin), diaminobenzidine (DAB) and hematoxylin were obtained from Beijing Zhongshan Golden Bridge Biological Technology Co. Ltd. (China). Blood was placed at room temperature. After the blood coagulated, serum was separated at 2500 r/min for 10 min. After the mice were sacrificed, two femurs were peeled off each mouse and both ends were excised to expose the BM cavity. A four-gauge sterile syringe needle was utilized to aspirate 2 mL phosphate buffer solution (0.1 M, PH 7.4) for repeated washing. BM cells were then collected into 15 mL centrifuge tubes, and centrifuged at 1000 r/min for 10 min to separate the supernatant. The contents of GM-CSF in the BM supernatant and blood serum were recorded using an r-911 full automatic radioimmunoassay counter (University of Science and Technology of the China Industrial Company) according to the GM-CSF radioimmunoassay kit’s instructions. The BM cell suspension was centrifuged at 2500 r/min for 10 min to discard the supernatant and the BM cells were collected in Eppendorf tubes. 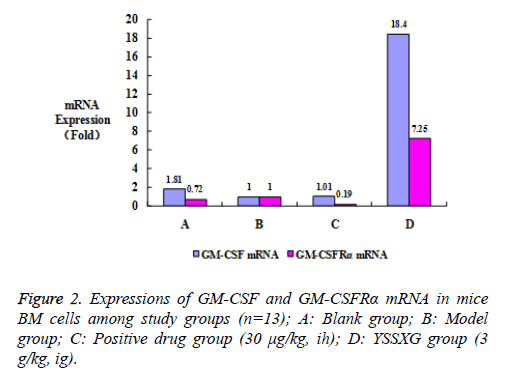 The mRNA expression of GM-CSF and GM-CSF receptor alpha (GM-CSFRα) in BM cells was analyzed by real-time polymerase chain reaction (PCR). Total RNA extraction: In order to extract total RNA, 1 mL trizol reagent was added to the BM cells, according to manufacturer’s instructions. The concentration, purity, and integrity of total RNA was measured using a DU-600 ultraviolet spectrophotometer (Beckman, USA) and 1.2% agarose gel electrophoresis. Single-stranded cDNA synthesis: Total RNA was reversetranscribed into cDNA using a Fermentas K1622 RT kit. Total RNA (1-5 μg) was dissolved in 2 × DEPC-treated water to 11 μL and 0.5 μg/μL oligo (dT), 18 primer 1 μL was then added. The sample was instantaneously centrifuged, heated at 65°C, and degenerated for 5 min. After a rapid cooling on ice, 5 × reaction buffer 4 μL, 20 u/μL RNA enzyme inhibitors 1 μL, 10 mM dNTPs mix 2 μL, and 200 u/μL M-MLV reverse transcriptase 1 μL were added to the sample; the total reaction volume was 20 μL. Reverse transcription was conducted at 42°C for 60 min, followed by the inactivation of the enzyme reverse transcriptase at 70°C for 10 min. The resulting cDNA was then used as a template for real-time PCR amplification immediately or was stored at -40°C for later use. Primer design and synthesis: Glycer aldehyde phosphate dehydrogenase (GAPDH) was utilized as the reference gene. Gene sequences of GAPDH, GM-CSF, and GM-CSFRα were obtained from Gene Bank, and Primer Express 3.0 software (ABI, USA) was used to design their primers. The primers of GAPDH, GM-CSF, and GM-CSFRα were synthesised by Beijing Saibaisheng Gene Technology Co. Ltd. (Table 1). Table 1: Primers used for gene expression detection in real-time PCR. Real-time PCR: Real-time PCR was performed according to the SYBR-green PCR Master Mix Kit protocol in a 7900 HT real-time PCR system (ABI, USA). The reaction system comprised the following: cDNA 1 μL, 10 μM upstream primer 1 μL, 10 μM downstream primer 1 μL, 2 × SYBR-green PCR Master Mix 10 μL, and 1% DEPC-treated water, which were added to the total sample volume of 20 μL. The reaction conditions comprised 5 min of denaturation at 95°C; 35 s of denaturation at 95°C, 35 s of annealing at 53°C, and 50 s of extension at 72°C, repeated for 40 cycles; extended for 8 min at 72°C. The melting curves and threshold cycle (Ct) values of the samples were detected during and after the reaction process, respectively. Relative gene expression was calculated using the comparative threshold cycle (2-ΔΔCT) method; ΔCT=CtTarget gene-CtGAPDH, ΔΔCT=ΔCTOther group-ΔCTModel group, and the relative mRNA expression level of the target gene was expressed in 2-ΔΔCT. Gene expression up-regulation was indicated by values ≥ 2, while values ≤ 0.5 indicated down-regulation. Human serum, 5-10 μL, was added to a piece of glass slide and mixed with mice sternum, the BM of which was extruded using medical hemostatic forceps. A piece of cover glass was used to push the BM forward, slowly at a 45°C angle. Smears were then dried naturally, and placed in an alcohol/ formaldehyde fixative solution (95% alcohol: 40% formaldehyde=9:1) for 1 min, and dried out. The protein expression of GM-CSF receptor beta (GM-CSFRβ) in BM cell membranes was assayed via immunocytochemistry. The smears were washed with PBS solution (0.01 M, pH 7.4) for 5 min, repeated three times, and then blocked with 3% perhydrol for 20 min, followed by another PBS wash for 5 min (× 3). The smears were then blocked with normal goat serum at 37°C for 20 min and incubated with rabbit anti-GM-CSFR beta antibody overnight at 4°C. The smears were then re-warmed for 20 min, washed with PBS for 5 min (× 3), and incubated with biotin labeling goat antirabbit IgG antibody at 37°C for 20 min. Following another wash with PBS (5 min × 3), they were incubated with HRPstreptavidin at 37°C for 20 min, and washed again with PBS (5 min × 3). The smears were then developed with DAB, counterstained with hematoxylin for 5 min, and washed with running water. The smears were differentiated using 1% hydrochloric acid alcohol (75%) for 30 s, washed with running water for 5 min, and then dehydrated through a grade alcohol series (5 min per grade). Following this, they were cleared with xylene for 15 min, repeated three times, and sealed with neutral gum. The mean density of positive protein in the smears was analyzed using Image-pro Plus 6.0 software (Media Cybernetics, USA). Statistical analysis was performed using SPSS 13.0 for Windows (Chicago, IL, USA). Differences between the means (± SD) were analyzed using one-way ANOVA, followed by the LSD-t test; P<0.05 was considered statistically significant. Power analysis was performed using GPower 3.1 software. Radioimmunoassay analysis showed that GM-CSF contents of BM supernatant and blood serum were significantly higher (for 138.4% and 125.5% respectively) in mice from the YSSXG group compared to the model group, the difference was statistically significant (P=0.036, P=0.002, respectively) and of sufficient statistical power (P=0.75, P=0.95, respectively) (Figure 1). 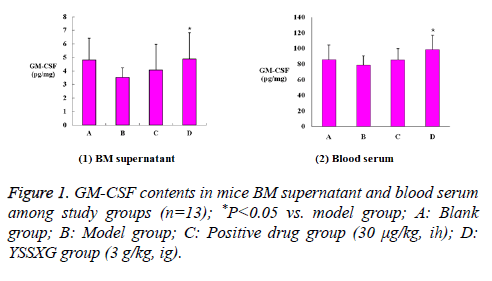 Figure 1: GM-CSF contents in mice BM supernatant and blood serum among study groups (n=13); *P<0.05 vs. model group; A: Blank group; B: Model group; C: Positive drug group (30 μg/kg, ih); D: YSSXG group (3 g/kg, ig). Real-time PCR analysis revealed that GM-CSF and GMCSFRα mRNA expressions in BM cells were significantly up Real-time PCR analysis revealed that GM-CSF and GMCSFRα mRNA expressions in BM cells were significantly upregulated in the YSSXG group compared to the model group (by 18.4 and 7.25 fold) (Figure 2). The positive expression of GM-CSFRβ protein was indicated by conspicuous light yellow to brownish-yellow granules under microscopic examination (X200 magnification, Figure 3). Mean density analysis revealed that GM-CSFRβ protein expression in BM cell membranes was substantially upregulated (P=0.042) in the YSSXG group compared to the model group. The statistical power is smaller than 0.8 (P=0.50). The low statistical power may be related to the small sample size (Figure 4). 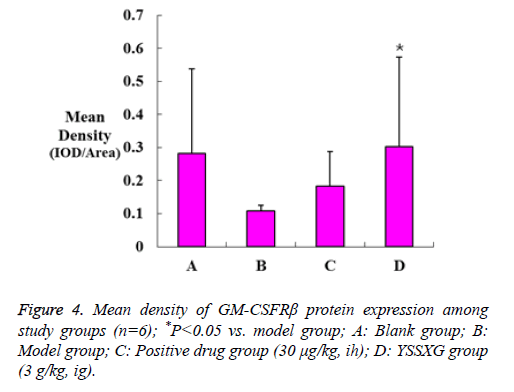 Figure 3: Mean density of GM-CSFRβ protein expression among study groups (n=6); *P<0.05 vs. model group; A: Blank group; B: Model group; C: Positive drug group (30 μg/kg, ih); D: YSSXG group (3 g/kg, ig). BM is very sensitive to Ionizing Radiation (IR), which not only causes acute myelosuppression, but also induces long-term BM injury . IR-induced acute BM suppression is primarily responsible for the induction of apoptosis in HSCs and Hematopoietic Progenitor Cells (HPCs), and long-term IRinduced BM injury is mainly attributable to the induction of Hematopoietic Stem Cell (HSC) senescence . In recent years, Hematopoietic Growth Factors (HGFs) have been used to improve acute BM suppression. HGFs can promote the recovery of BM hematopoietic function by stimulating the proliferation and differentiation of HPCs . GM-CSF, a member of the HGF family, is produced by macrophages, T cells, mast cells, endothelial cells, fibroblasts, mesothelial cells, and epithelial cells, among others [9,15]. It has broad biological activities, such as the control of hematopoietic cell survival, stimulation of both the proliferation and differentiation of early hemopoietic progenitor cells, and the regulation of the function in mature cells including neutrophils, eosinophils, and macrophages [9,10]. 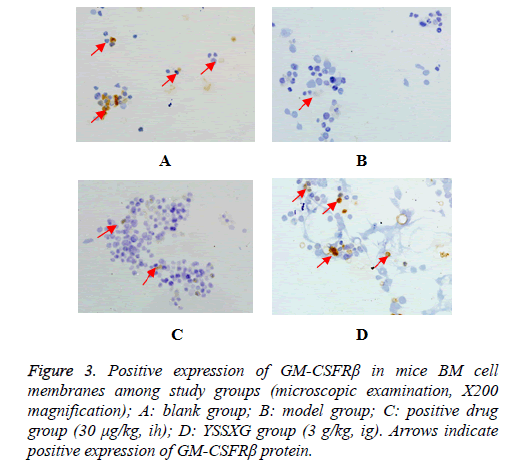 This present study showed that, compared to the model group, the differences of GM-CSF contents in mice BM supernatant and blood serum in the YSSXG group have statistical significance, and GM-CSF mRNA expression in BM cells was up-regulated. This indicates that YSSXG can enhance the expression and secretion of GM-CSF in BM. But the relative quantitative method was used in real-time PCR data analysis in this paper, which method could not accurately quantify the gene expression level, so there will have some limitations. GM-CSF exerts its biological effects by binding to the GMCSF receptor at the cell surface. GM-CSFR is a transmembrane receptor, which is widely expressed by a variety of cells, such as myeloid progenitor cells, monocytes, neutrophils, eosinophils, basophils, and dendritic cells [9,10]. It is composed of alpha and beta subunits. The alpha subunit is soluble and contains the recognition site for GM-CSF. However, it is unable to mediate signaling alone. The beta subunit exerts its principal effect on signal transduction, mediated by GM-CSF, but it is incapable of binding GM-CSF alone. Therefore, GM-CSF must initially bind to the alpha subunit with low affinity; the beta subunit is then able to bind to the alpha subunit, forming a high-affinity complex [16-19]. The results of this present study revealed that GM-CSFRα mRNA expression in mice BM cells and GM-CSFRβ protein expression in BM cell membranes were both substantially upregulated in the YSSXG group compared to the model group. This indicates that YSSXG can increase the expression of GMCSFR in BM. After the binding of GM-CSF to GM-CSFR, some of the receptor-associated protein kinases are activated rapidly. This results in the activation of multiple signal transduction pathways, such as the Janus Kinases 2-signal transducers and activators of transcription 5 pathway, the ras-mitogenassociated protein kinase pathway, and the phosphoinositol 3- kinase pathway. Following this, stimulus signals are transmitted to nucleus, regulating relational gene transcription and controlling the proliferation and differentiation of hematopoietic cells [16-18,20]. The findings of this present study suggest that YSSXG may improve radiation-induced BM injury repair by up-regulating the expressions of GM-CSF and GM-CSFR. Whether YSSXG can effectively promote the binding of GM-CSF and GM-CSFR to transmit cell proliferation and differentiation signal still need further research. The cell proliferation and differentiation of myeloid hematopoisis regulated by YSSXG were related to promoting the expressions of GM-CSF and GM-CSFR in BM. This research was supported by the National Basic Research Program of China (“973” Program; No. 2010CB530406), the National Natural Science Foundation of China (No. 81774176), the Traditional Chinese Medicine Research Projects of Capital (No. 16ZY02), the Natural Science Funds of the Capital Medical University (No. 2015ZR27), and the Planned Project on Beijing Traditional Chinese Medicine inheritance of “3+3 Programme” of the Beijing Chinese Medicine Administration Bureau (No. 2012-SZ-B-27). Wu ZK, Jiang BH, Li CJ, Chen SH, Liu FY, Cui JH. Modern research on the theory of kidney produce sui. J Trad Chin Med 1999; 40: 626-628. Fang SP, Wu ZK, Zhang XH, Liu YM, Wang WJ, Chai LM. Clinical observation on Yisui Shengxue granule on treating 156 patients with β-thalassemia major and the molecular mechanism study. Biol Pharm Bulletin 2007; 30: 2084-2087. Wang WJ, Wu ZK, Zhang XH, Liu YM, Fang SP, Zhang C. Effect of Yisui Shengxue granule on the oxidative damage of erythrocytes from patients with hemoglobin H disease. Chin J Integr Med 2012; 18: 670-675. Chu NL, Wu ZK, Zhang XH, Fang SP, Wang WJ, Cheng YL. Molecular mechanism of Yisui Shengxue granule, a complex Chinese medicine, on thalassemia patients suffering from hemolysis and anemia of erythrocytes. Evid Based Complement Alternat Med 2014; 2014: 213782. Liu L, Zou Y, Li JL, Fang SP, Li M, Wu ZK. Influences of tonifying the kidney to benefit morrow on peripheral blood in irradiated mice. Chin J Exp Trad Med Formulae 2012; 18: 217-222. Zou Y, Sun YW, Fang SP, Li JL, Cheng YL, Liu L. Effect of Yisui Shengxue granules on the proliferation of hematopoietic progenitor cells in irradiated mice. J Trad Chin Med 2013; 54: 1677-1680. Sun YW, Cheng YL, Zou Y, Fang SP, Liu L, Tan HL. Effects of emodin and psoralen on hematopoietic function in irradiated mice. Lishizhen Med Material Med Res 2014; 25: 2342-2344. Wang WJ, Liu L, Zou Y, Li JL, Liu YM, Fang SP. Influence of Yisui Shengxue granule on the cell cycle of bone morrow cells in mice irradiated by 60Co-γ Rays. Chin J Exp Trad Med Formulae 2013; 19: 179-182. Griffin JD, Cannistra SA, Sullivan R, Demetri GD, Ernst TJ, Kanakura Y. The biology of GM-CSF: regulation of production and interaction with its receptor. Int J Cell Cloning 1990; 8: 35-45. Baldw GC. The biology of granulocyte-macrophage colony-stimulating factor: effects on hematopoietic and non-hematopoietic cells. Dev Biol 1992; 151: 352-367. Sun YW, Liu QH, Wen J, Wu ZK. Fingerprint chromatograms and characteristic peaks of Yisui Shengxue Granules. Chin Trad Patent Med 2014; 36: 125-130. Wang Y, Schulte BA, Zhou DH. Hematopoietic stem cell senescence and long-term bone marrow injury. Cell Cycle 2006; 5: 35-38. Shao LJ, Luo Y, Zhou DH. Hematopoietic stem cell injury induced by ionizing radiation. Antioxid Redox Signal 2014; 20: 1447-1462. Wang Y, Probin V, Zhou DH. Cancer therapy-induced residual bone marrow injury-Mechanisms of induction and implication for therapy. Curr Cancer Ther Rev 2006; 2: 271-279. Gasson JC. Molecular physiology of granulocyte-macrophage colony-stimulating factor. Blood 1991; 77: 1131-1145. Doyle SE, Gasson JC. Characterization of the role of the human granulocyte-macrophage colony-stimulating factor receptor α subunit in the activation of JAK2 and STAT5. Blood 1998; 92: 867-876. Polotskaya A, Zhao YM, Lilly ML, Kraft AS. A critical role for the cytoplasmic domain of the granulocyte-macrophage colony-stimulating factor alpha receptor in mediating cell growth. Cell Growth Differ 1993; 4: 523-531. Broughton SE, Dhagat U, Hercus TR, Nero TL, Grimbaldeston MA, Bonder CS. The GM-CSF/IL-3/IL-5 cytokine receptor family: from ligand recognition to initiation of signaling. Immunol Rev 2012; 250: 277-302. Woodcock JM, McClure BJ, Stomski FC, Elliott MJ, Bagley CJ, Lopez AF. The human granulocyte-macrophage colony-stimulating factor (GM-CSF) receptor exists as a preformed receptor complex that can be activated by GM-CSF, interleukin-3, or interleukin-5. Blood 1997; 90: 3005-3017. Hayakawa F, Towatari M, Iida H, Wakao H, Kiyoi H, Naoe T. Differential constitutive activation between STAT-related proteins and MAP kinase in primary acute myelogenous leukaemia. Brit Haematol 1998; 101: 521-528.